Apparently Marvel Studios can do no wrong. They've made 12 movies so far, and none of them have been a serious misfire. Sure, a few of them weren't fantastic and a couple had rumors of troubled production, but they have yet to produce something as messy as (say) any of the Transformers, Fantastic Four, or Amazing Spider-Man movies. That's pretty impressive for a studio that has less than a decade of experience at producing their own films. Before Iron Man in 2008, they licensed their characters out to other studios. The fact that that in the space of eight years they have been able to repeatedly out-perform studios that have been operating for 80 years makes it seem like they have some sort of supernatural ability. Marvel's rise from plucky upstart to industry titan has been so abrupt that if you made it the plot of a movie, I'd say it sounded completely implausible. I've never heard a good explanation for how this happened, other than the hand-wave of "Marvel gets these characters." But that argument doesn't actually explain what went right at Marvel, or what keeps going wrong at 20th Century Fox and Sony Pictures. Fox could easily hire someone that "gets" the Fantastic Four. If that was really the magic ingredient to success, then why didn't they? Lots of Marvel comics have had bad runs where a new author didn't really "get" the hero that had been assigned to them. Marvel has published plenty of regrettable trash over the decades. How did they avoid making those mistakes in their movies? But fine. Marvel is unstoppable. But this makes me wonder: Why haven't they tried to bring that magic - whatever it is - to the other billion-dollar culture-defining industry? Where are the Marvel games? Yes, Marvel Heroes is a thing. But that's a middling, unoriginal, and unambitious little MMO-ish cash-grab designed to sell characters and game content piecemeal. There was also that one Deadpool game. 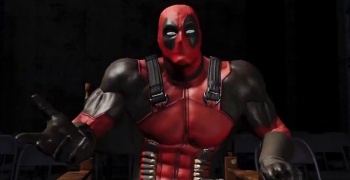 But Marvel doesn't own the movie rights to Deadpool and I doubt they had much (if any) say in the development, or even if the game got made in the first place. Lots of people who know way more about this than I do are suggesting that Marvel is trying to dial back how much attention they give to heroes that can't appear in the Marvel Movieverse. So maybe I should refine my question: Where are all the good Marvel games designed to leverage the popularity of the Marvel Movies? About a year ago I made a list of characters that would fit into an established set of mechanics or genre. But that list was by no means all-encompassing, and I think almost anyone from the current Marvel Cinematic Universe would be a good fit. There are 11 more Marvel movies planned, and the pool of potential video game characters keeps growing. Where's our Iron Man game? Thor? Captain America? Hulk? Ant-Man? Guardians of the Galaxy? Black Widow would be pretty good if they went for a sort of Uncharted-style mashup of shooting and platforming, and Daredevil would probably work really well as an Arkham-style grimdark brawler. These characters are culture-bending, meme-spawning, industry-shaking juggernauts right now. Why aren't they capitalizing on that? Why aren't they using the success of the movies to sell games, and why aren't they using games to sell movies? Where is Marvel's answer to the Arkham series? Look at the above list of heroes, and then look at the current list of current Marvel games, which is a list of inadequacy and sadness. Most of the games are for characters like Spider-Man and X-Man, which are out of Marvel's hands. The rest are just small mobile tie-ins. Maybe this isn't a bad thing. Maybe this is a large corporation showing some restraint for a change, and focusing on what they're good at instead of branching out into markets beyond their core skills. Maybe it's better that they focus on making great movies instead of middling video games. But it's hard not to look at this lineup of superhero movies and Marvel's abrupt talent for making them and wonder what sort of wonderful things we'd get if the same thing happened for a Marvel video game division. This might be a case of "be careful what you wish for", but I'm wishing for it anyway.